No evacuation notices or alerts are in effect for the fire area. The Lower Skilak Lake Campground and boat launch are now open; burn ban remains in effect. Fire crews are taking advantage of the recent cooler and moist conditions as they continue to “mop-up” (extinguish all burning material) up to 200’ from the firelines. Yesterday, very light precipitation was reported over most of the fire area. Up to .10” of rain fell in the west end of the fire. Humidity was recorded above 45% with light winds. Today, very similar conditions are expected with winds increasing to 10-15 miles per hour and gusts up to 25 mph from the east. 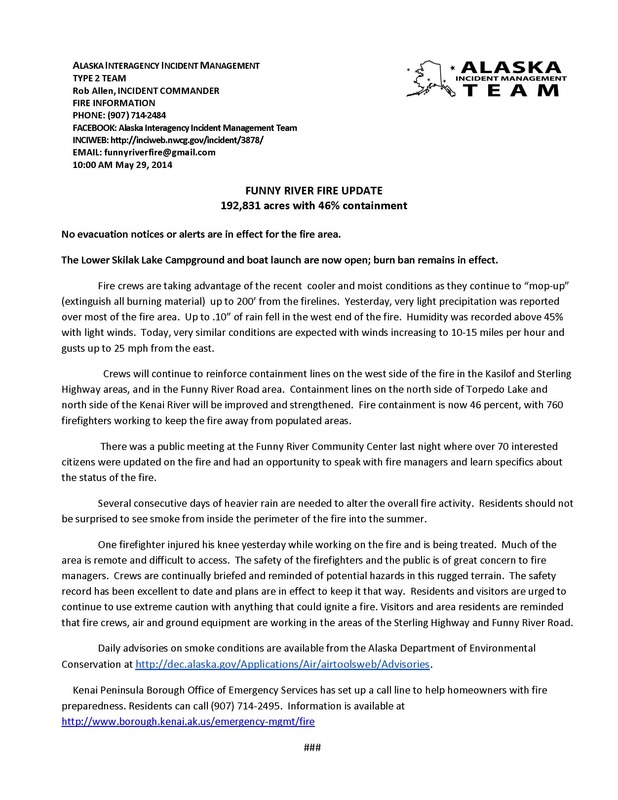 Crews will continue to reinforce containment lines on the west side of the fire in the Kasilof and Sterling Highway areas, and in the Funny River Road area. Containment lines on the north side of Torpedo Lake and north side of the Kenai River will be improved and strengthened. Fire containment is now 46 percent, with 760 firefighters working to keep the fire away from populated areas. There was a public meeting at the Funny River Community Center last night where over 70 interested citizens were updated on the fire and had an opportunity to speak with fire managers and learn specifics about the status of the fire. Several consecutive days of heavier rain are needed to alter the overall fire activity. Residents should not be surprised to see smoke from inside the perimeter of the fire into the summer. One firefighter injured his knee yesterday while working on the fire and is being treated. Much of the area is remote and difficult to access. The safety of the firefighters and the public is of great concern to fire managers. Crews are continually briefed and reminded of potential hazards in this rugged terrain. The safety record has been excellent to date and plans are in effect to keep it that way. 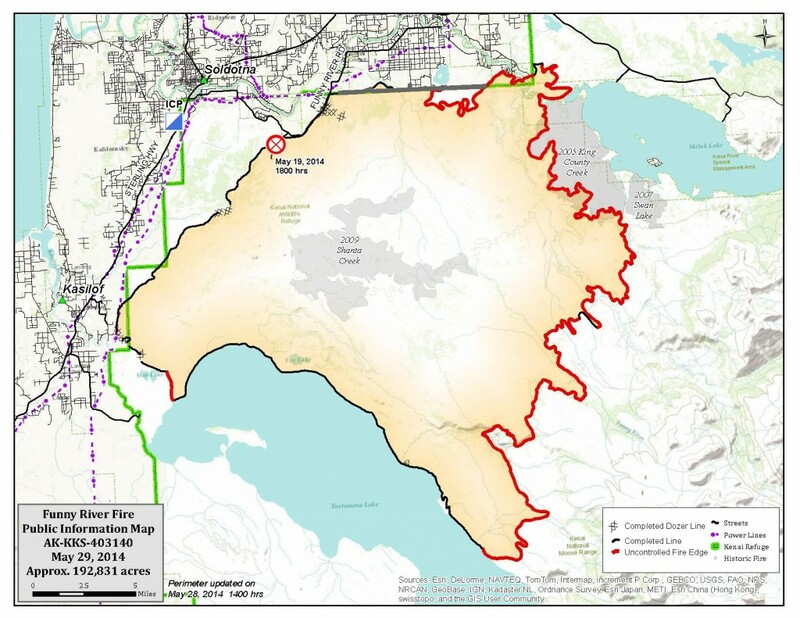 Residents and visitors are urged to continue to use extreme caution with anything that could ignite a fire. 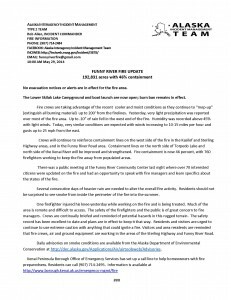 Visitors and area residents are reminded that fire crews, air and ground equipment are working in the areas of the Sterling Highway and Funny River Road. This entry was posted on May 29, 2014 at 10:56 am. You can follow any responses to this entry through the RSS 2.0 feed. You can skip to the end and leave a response. Pinging is currently not allowed.